Hurricane Harvey hit Texas’ gulf coast last week, causing widespread damage and totaling estimates of anywhere from 500,000 to a million cars in the state. And, to help out, automakers are offering huge incentives of $500 to $750 off of a brand-new car. That’s enough bonus cash to replace half of a nice TV. The automaker discounts require an insurance claim that shows damage to a vehicle that happened on or after the hurricane hit on Aug. 25, according to Cars Direct. The incentives don’t appear to be attached to any sort of brand loyalty, such as only being able to get the discount from Ford if it was your Ford car that got damaged or totaled in the storm. 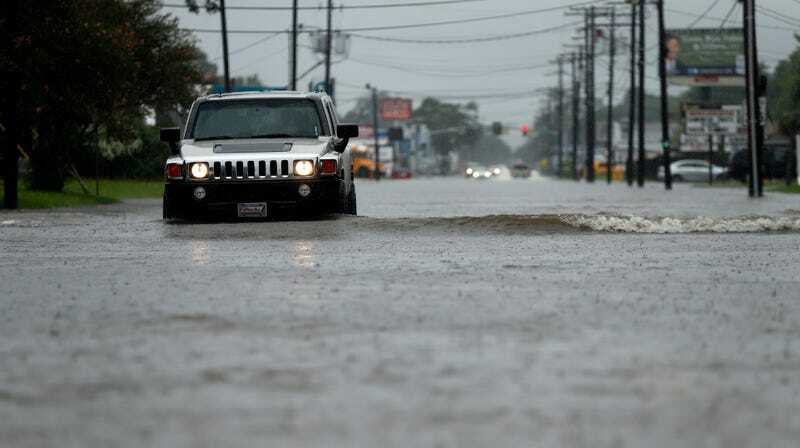 Fiat Chrysler Automobiles: FCA, which is the parent company for Dodge, Jeep, Chrysler, Ram, Fiat and Alfa Romeo, will offer $500 off for those in select Texas and Louisiana counties affected by the hurricane. The $500 counts toward certain cars, excluding the Dodge Viper, Jeep Wrangler, Chrysler 200 and the SRT performance models. Those seeking a discount will need to bring insurance claims that show vehicle damage from the hurricane, and the offer ends on Jan. 2, 2018. Hyundai: Hyundai and Genesis will offer $750 to those in both Texas and Louisiana on all new 2017 or 2018 cars. Buyers must show an insurance claim from hurricane damage, but the automaker is not restricting the deal to certain counties within the states. The deal ends on Jan. 2, 2018. General Motors: Those in select counties in Texas can receive $500 in bonus cash on the purchase of all new 2017 or 2018 Chevy, GMC, Buick or Cadillac vehicles. Buyers must show insurance claims on a vehicle as a result of hurricane damage, and the program goes until Jan. 2, 2018. Kia: Like Hyundai, Kia will offer $750 to those in both Texas and Louisiana on all new 2017 or 2018 cars with no county restrictions. Buyers must show insurance claims as a result of hurricane damage, and the program ends on Jan. 2, 2018. A mere $500 or $750 on a new car seems trivial when you think about the loss and devastation the storm caused all over the coastal regions of Texas, and our resident car buyer Tom McParland did some math to estimate that $500 off of, say, $30,000 on a five-year loan at 4-percent APR saves $9 a month. Sure, $9 a month is $9 a month, but it won’t get you very far in the long run. It’s also hard not to feel like this is a recycled marketing tool—after Hurricane Sandy in 2012, which USA Today reports ruined around 250,000 vehicles, these carmakers offered virtually the same discounts. The Car Connection had deals listed at $500 from Ford, GM and Chrysler, while Hyundai was again at $750. But a discount is more than nothing, at least, and it’s not the only thing car companies have done: Ford put at least $100,000 into disaster relief from the hurricane, and Automotive News reports that Toyota gave more than $3 million, Mercedes-Benz $1 million, Honda and Subaru at least $100,000, and Nissan and Volkswagen at least $150,000. That, if anything, seems a lot more helpful than some new-car discounts.